In this VHDL project, a simple low pass FIR filter is implemented in VHDL for ECG Denoising. VHDL code for the FIR filter is fully presented. The VHDL code for the FIR filter is simulated and verified by comparing the simulated results in Modelsim with the correct results generated from Matlab. Sample ECG inputs are provided in input.txt files, the VHDL filter code reads those ECG files, apply digital filtering, and write the results into output.txt files for verification. It is obvious that one of the most critical steps in ECG digital signal processing is noise filtering because ECG signals are noisily affected by many different sources such as Baseline Wander, EMG interference, and power line noise. Those noises can be reduced by many filters as shown in the figure above. This project is to implement a low pass FIR Filter in VHDL to reduce high-frequency noise and power-line interference. In this project, the regular implementation of the FIR filter as shown in the following figure is implemented in VHDL. The FIR filter is basically implemented by using D-Flip-Flops, signed multipliers and adders. A basic block includes one N-bit register, one multiplier, and one adder. The VHDL generate statement is used to generate the full design using the basic block. After running simulations in Modelsim, the filtered output is written into output.txt for verification. The verification is done by comparing the output file with the correct result generated from Matlab. Like to run this on my Arty board but is having a hard time to get the ADC configured.Any help for a ADC interface available? This is a regular implementation of FIR Filter. It is not designed by using frequency sampling method. You compiled or synthesized the testbench, that's why you got that error. You only run simulation with the testbench. Synthesize the top level only (FIR_RI). Thanks for your quick help. Yes indeed, I've compiled the test bench. So, the testbench just has to be written as a module, I thought it was the main module (top level) to compile ? Sorry, I'm a beginner !! Thank you for the code, i am having a problem with input output and coefficient width . what are they for kaiser window or how to calculate them?? Mình gặp lỗi này khi chạy simulation. "File input101.txt could not be opened"
Mình cần phải đặt vào đâu nhỉ? Bo vao folder ban chay simulation nhe. Does anyone have a MATLAB program with this filter implemented that gives the same output? I tried creating FIR filter using coefficients from this project, but I am getting completely different output. 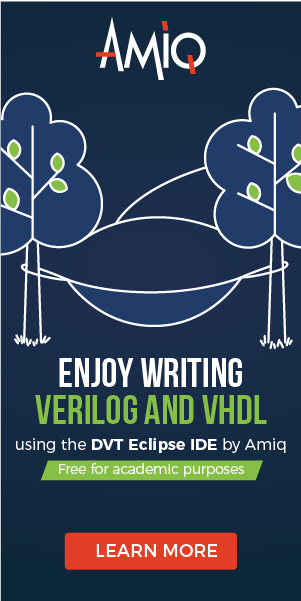 if you use this VHDL code, you will generate the same output as Matlab. will it work on xilinx ise too? It was simulated in Xilinx ISE. hi van. thank you for code. i have a doubt that you have applied text input through text bench, then how to apply it for fpga. In that case, you need to create a synthesizable model to pass the text file data to the FIR filter. Will it work for Altera Quartus Prime? How do I get the input file? sure it works. The input files are given above. Cho em hỏi, em copy code vào file .vht, rồi start compilation thì không có lỗi gì. Nhưng khi vào folder chạy simulation (đã có file input trong đó) thì không thấy file output đuôi .txt đâu. Không biết đây là lỗi gì hay cách em chạy mô phỏng bị sai? Mong được giúp đỡ. Em dùng Quartus II 12.1. You have to run simulation until output_ready = '1' so that the output file is written. Sample input and output files are not there anymore in the link you have provided. I request you to kindly provide it again. Sorry I have updated the link. I did run modelsim simulator keeping 'input101.txt' file in project folder. i got 'output101_functional_sim.txt' file which is not same as 'output101.txt' sample file provided by you in the link. Number of values in 'output101_functional_sim.txt' file is very less than the number of values in 'output101.txt' file. Please help regarding it. Double check your simulation. The code was verified and all the outputs were approximately matched with the provided samples.